Massage is a “Luxury” YOU Can’t Afford to Miss. At Ella’s Vacation Rentals, we’ll help you look and feel your best on your well deserved vacation. Just like eating nutritious food, and regular exercise, taking time for massage is a good way to maintain your health and wellness. About Silvina: She is a seasoned Licensed Massage Therapist, accredited by National Certification Board of Therapeutic Massage & Bodywork. She is ethical, calm, spiritual and always smiling. She will arrive to your beautiful suite. Every person has a gift. When people are happy they bring they goat to the world. Each person is unique. Someone gift is respect and they bring respect to this world. Some people have a gift of consideration and they treat the rest with at most considerations. Silvina’s gift is unique. She brings good energy and health into this world. Intuitively she knows what one’s trigger points are. You take a vacation to recharge your batteries, to get away from the daily grey routine. Stress is part of everyday life, yet it takes a toll on your health. The effects of stress can pile up before you are even aware of them. Silvina will help you or your loved one’s to restore the balance and wellness. Regardless why you need a massage. Give yourself a spacial treatment. Rejuvenate and relax your spirit and senses. Life is Good. Please call Selvina in advance to make an appointment. During the season, she is very busy, so do not wait! 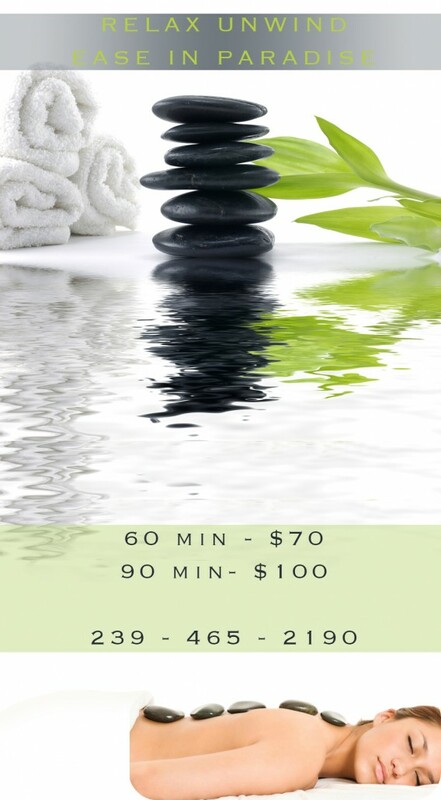 Massage Therapist Fort Myers: Massage is a very holistic therapy where the human being is seen and treated as an ever-changing network of physical, mental, emotional and spiritual aspects that all influence each other. It can help with the bad energy that is trapped or blocked, causing physical and emotional dis-ease to be removed. Even thou, I am not a hotel or a resort, I do operate like one. When you arrive to Ella’s vacation rentals, you are not arriving to accommodations and left to be all on your own to figure out where to go or what to do. When you choice the accommodations I offer, you get your own personal travel guide, your personal concierge and will be well taken care off as it is was the million dollars resort! Personally, I am a massage connoisseur. After being spoiled by the 5 start spa treatments at Ritz and other high end hotels all over the world, it was incredible hard for me to find a high quality and affordable massage therapist, here Florida. After one year of trial and failure, I have finally found a high quality massage therapist, Silvina. Here I am to share her healing treatment with my guests. I know that some of you come to celebrate your anniversary or a honeymoon, or a simple Romantic get away. Treat your loved one for a nice relaxation treatment. You may also want to consider one of my Romance Package. Treat your loved one with roses, chocolates, wine . . . Please click to go to my Romance Page. Love is in the air, oh yeah!